Magic: Puzzle Quest Spotlight: Card Visual Aid - D3 Go! The tensions in Ravnica are rising and new guild conflicts are to come. To allow players to enjoy it in the best way that suits them, we’ve implemented a new feature called the Card Visual Aid. This new feature seeks to improve player experience when casting cards and triggering effects. The Card Visual Aid feature is a new configuration option that allows players to skip OR hold cards when they pop up on the screen after being cast or created. This new option allows new players to slow down the game to learn and understand special mechanics and card effects. On the flipside, this would also allow veterans to skip animations or effects they’re already aware would happen. The Card Visual Aid is located on the Settings configuration with three different options available: Auto, Step-by-Step and Off (disabling the Visual Aid). Here is some information about the three modes. Auto: This is the current standard mode of MTGPQ, and most players are used to it. By enabling this option, cards and effects will pop up and briefly remain on screen. Step-by-Step: The new default option. This is the best mode for new players and for those who want to take their time to read the card’s text and appreciate its artwork. In this mode, cards and effects will pop up and remain on screen until the player taps anywhere. Off: By turning off the Visual Aid, veterans and players with low spec devices can benefit from a faster gaming experience. This disables banners and visual effects of cast cards and triggered tokens. We hope you all enjoy this new feature! 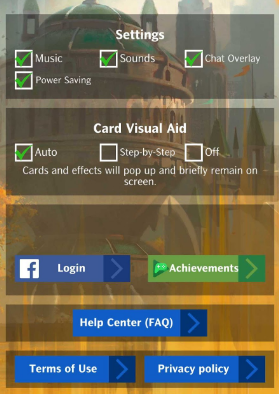 Card Visual Aid will arrive with the v3.2 update, scheduled for the week of January 21. Visit HERE to read the Pre-Release Notes. Learn about the new Player Profile and Player Level HERE.